Join us for a special end-of-year podcast episode this week where we invite you to sit in a circle with us and reflect on your year - on all that has happened, all that you’ve learnt and the ways in which you’ve grown. And if you did Goodbye 2017, Hello 2018 we’ll also be looking at how your focus or intention for 2018 shaped your year, which of the dreams and goals you wrote in your journal happened aaaand which ones didn’t (because there is always a lesson in that too!). We’ll be doing it with you along with two very special guests from our Project Love tribe: Leah Stewart (someone who has been part of our online community for a long time, but who we had never met until the recording!) and Bexy Cameron (one of our best friends, the first person (other than Selina) to ever do the very first ‘Goodbye, Hello’ and the person who introduced us!). Listen in as we each reflect on our year and invite you to do the same and if you did Goodbye 2017, Hello 2018 we’d love to hear how it helped you to shape your year. Wishing you a wonderful Xmas and here’s to a fulfilling 2019! P.S. For an extra boost of inspiration check out our latest ‘Success Story’ from Laura Croft whose gorgeous Letter & Brush business grew out of her doing Goodbye, Hello over the past two years. 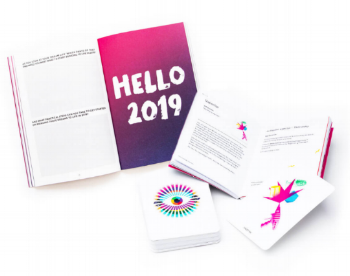 P.P.S And if you haven’t yet ordered your copy of the ‘Goodbye 2018, Hello 2019’ journal then order TODAY (19th Dec) for delivery before Christmas!